I hadn’t originally intended to visit Exmouth Market Grind since I was on my way across the road to Caravan. However, as I walked past, I spotted Lizzie, a barista friend who I’d known from her early days at KuPP, standing behind the counter. At that point, it would have been rude to walk on by, so I went in. 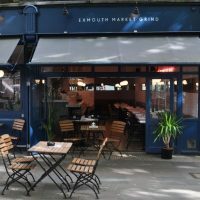 Like Caravan, Exmouth Market Grind occupies a corner spot, with windows facing out onto Exmouth Market at the front, and along maybe half the left-hand side, which runs down Pine Street. It feels like two long, thin units knocked into one, with the door right on the corner. That said, there’s another door towards the back on the left-hand side, while the right-hand set of windows on the Exmouth Market side can be opened all the way back in good weather, although you’re not really supposed to use it as an entrance! There’s plenty of seating outside, with tables along the windows on both sides, plus a second row of tables on the opposite side of the pavement on Exmouth Market. If you’d prefer to sit inside, then you have even more choice, with the central counter following the line of the wall between the two units and splitting the space into two. There is seating at the front, with another line of tables running along the windows, but the bulk of the seating is down either side. There are a handful of tables in the windows on the left, with another handful of tables, plus a larger, communal table at the back. Meanwhile, on the right-hand side, two long, padded benches line the white-washed brickwork of the right-hand wall, a mix of square two- and four-person tables in front of it. Finally, right at the back, there’s a lovely, cosy niche with a red, padded bench around all three walls, plus a few tables. From here, a gap in the wall connects you back with the seating on the left-hand side. This effectively turns the counter, which runs down the centre to about two-thirds of the way back, into an island. The coffee and cake operation is on the left, while to the right, it’s more focused on cocktails. Best of all, you can sit at the counter itself, with comfortable bar-chairs lining all three sides. Sadly I popped in during the day, so wasn’t able to sample any of the food. However, I’ve had several meals at Grind, including dinner at London Grind and breakfast at Shoreditch Grind and the pop-up at this year’s London Coffee Festival, and I’ve always been impressed. Instead, Lizzie was keen to show off the coffee, which had recently changed. There was a new house-blend, combining two Brazilians and a Colombian, which formed the basis of a lovely, smooth flat white. The coffee was in harmony with milk, which was from The Estate Dairy, but at the same time, the taste came strongly through. Next we turned to the single-origin espresso, which was from Peru. I describe this as the guest espresso, which is a little inaccurate since the house-blend is used for milk-based drinks, the single-origin for espressos and Americanos. This was also very impressive, a lovely, fruity espresso which clearly demonstrates the Grind has got the hang of this roasting lark! Disclaimer: in 2015, Grind launched a bond to fund its current expansion. I invested in this bond, and, like all bond-holders, receive free coffee as a reward (although I still have to pay for everything else). My decision to write about Exmouth Market Grind was in no way influenced by my investment. This entry was posted in Bars, Breakfast, Cafe/Roaster, Cafes, Cake, Central London (East), Coffee & Wine, Coffee Terraces, Dinner, Evening Opening, Island Counters, Laptop Friendly, Late Opening, Lunch, Restaurants and tagged Grind, include by Brian Williams. Bookmark the permalink.